Head through the purple door on the south-east corner of Roden House. Go up the spiral stairs, then straight on when you reach the first floor. 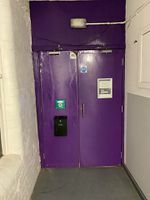 The purple door to the hackspace. The building has a goods lift that can provide access via the doors on the North side of Roden House. The 'Winners Gym' entrance. Once upstairs, the 'back door' to the upstairs workshop has been fitted with Gatekeeper RFID Access so it is possible to enter the space through the double width fire doors. The goods lift is 5' deep x 6'1" wide x 7' high. Note: The corridor is 4' wide at its narrowest point, between the lift and the workshop. If you park at the Queensdrive park and ride you can take the Citylink 1 bus directly to Fletcher Gate (the buses always make a scheduled stop here). From here, follow the walking directions to the space. 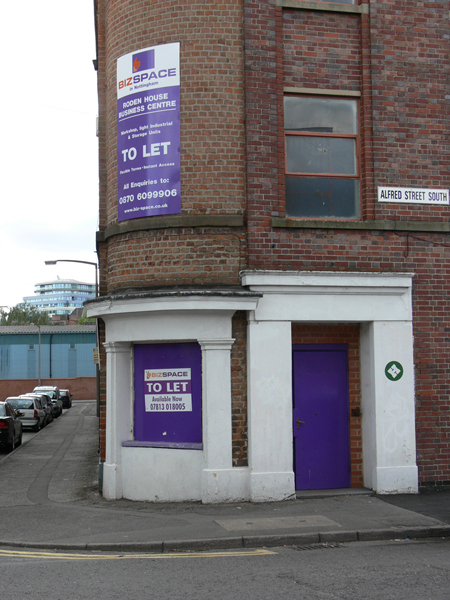 There are on-street parking spaces right outside the Hackspace on Ashley Street, Alfred Street South, Lowdham Street and Roden Street, they're free of charge, (but often occupied during the daytime). Parking on Robin Hood Street and Stonebridge Road is restricted to residents 8a.m - 6p.m Monday - Saturday. The first hour is free - but you will still need a ticket, press the button on the ticket machine without inserting any coins to get the free ticket. After the first free hour, parking is £1 per hour up to 4 hours or £6 for 24 hours. There is space in the workshop for several bikes to be locked up. There is also a secure Nottingham CityCard Cycle Hub next to the Victoria Leisure Centre (less than 5 minutes walk from the hackspace). You will need a Nottingham CityCard which has been activated for Cycle Hub access to open the gate. From the station, it is necessary to cross or follow the A60, the main north/south road through Nottingham. Note: The London Road (A60) roundabout can be very busy, and is very wide. It might be better to walk around it if you're unsure either of your route or your cycling skills, or follow the alternative route below. Turn left along London Road (A60). Position yourself in the third or fourth lane (of four) for the roundabout. At the roundabout, you will be taking the second exit. You want to be in the third or fourth lanes (of four) leaving the roundabout. Exit the roundabout at the second exit. Stay in the third/fourth lane and turn right onto Fischer Gate. Turn left onto Manvers Street. Continue to the next junction. Turn right onto Southwell Road. Continue to the next junction. Go straight on (road turn slightly left). Take the third turning left onto Alfred Street South. At the junction with Ashley Street, you have reached the Hackspace. Cross London Road (A60) using the pedestrian crossing just before the roundabout. Between the BBC building and the Premier Inn is the City Link road. Follow this road to the end, then turn left onto Manvers Street. Follow Manvers Street to the end (junction with Southwell Road). Follow the route from step 8 above. An alternative is the route 39 to Carlton Valley, which has a stop known as 'Roden Street' on Robin Hood Street. These buses run from the Victoria Centre (stop V1, outside Boots on the south side of the Victoria Centre). However, it is almost certainly quicker to walk to the hackspace from here than to get a bus. From Broadmarsh Bus Station, get the City Loop bus to the Victoria Centre and change onto a Lilac Line bus (see above). If you are travelling by canal, you can moor your narrowboat at Nottingham Castle Marina. From there it is a 20 minute walk to the train station along the canal. Follow the walking directions from here. Fly to East Midlands Airport and catch the Skylink bus, which stops outside the railway station and in Friar Lane. Follow the walking directions from here. Nottingham Tollerton (Nottingham City Airport) is the nearest GA airport, located to the east of the city. From here, you can get a taxi directly to the space, or walk into Gamston and get the Green Line numbers 5, 5A or 7 from the Morrisons. This bus will stop at the Lace Market and Victoria Centre. Follow walking directions from there.